On Friday, I picked up plant material from the Foundation Plant Services at University of California, Davis that we will use to bud a back half-acre of property. Vines, and eventually grapes, will grow from these buds on Block 5, known as Celeste’s block, so it’s important that they are healthy and disease free. Foundation Plant Services is dedicated to insuring that disease-free plant material exists for use in the agriculture industry. FPS is a cooperative effort between the University of California, the U.S. Department of Agriculture, the California Department of Food and Agriculture and the grape industry. 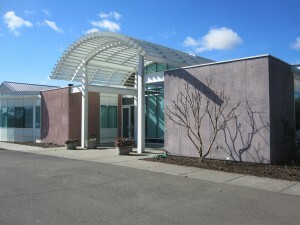 There are similar facilities in other states: in Washington, they are known for addressing diseases in hops, and in Oregon, they are known for addressing disease in berries. While UC Davis FPS deals with all kinds on plants – they were working on strawberries when I was there – they are the place for clean wine grape materials. While there, I met Dr. Deborah Golino, who runs the program, and got a quick tour from Michael Cunningham, production manager, who was responsible for getting me our plant material. I should say that it is unusual for a vineyard like ours to get access to FPS stock. The program is designed to supply plant material to commercial nurseries for propagation, but due to my interest in the FPS program and involvement with UC Davis, I was given the opportunity to get some. Very exciting! The meristematic tissue is at the very top inside the two flaps. The dark purple streak at the bottom is a virus in the phloem. The virus has gone up as far as it can go. The process of creating clean plant material is really interesting. Work with me here, because this gets a little technical, but it is important. Plant viruses live in the phloem and xylem, which are essentially pipes that move water, nutrients and sugar through the plant like a plumbing system. In grapevines, the tissue responsible for growth, called meristematic tissue, is at the very tip of the vine. The meristematic tissue is undifferentiated tissue, meaning that it hasn’t yet turned into specific plant organs, like phloem and xylem, but it is capable of becoming everything. Because the phloem and xylem don’t reach into the meristematic tissue, viruses aren’t there. So, FPS takes meristematic tissue from a diseased grape plant, and then grows it into a new, disease-free clone. It is like magic. Once the plant material goes through the FPS program it is certified as disease free and listed in the National Grape Registry. It is then available for use by the industry (or in our case, for use in our vineyard). Do you think you know how many grape varieties there are? Go take a look at the National Grapevine Registry. I bet you underestimated!